As with all mammals, cats produce two types of pigment: eumelanin (black) and phaeomelanin (red/yellow). These pigments are mixed and matched with dilutions, modifiers, and white patterns to produce the rainbow of colors seen in the domestic cat. One of the genes that controls the switch between black and red pigment is MC1R, otherwise known as extension. Although in other species, many mutations in MC1R are known to exist, in the domestic cat there is only one known mutation of extension. This mutation creates what is known as Amber coloration. 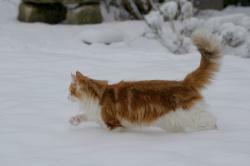 Currently, it is only found in Norwegian Forest Cats. This mutation results in kittens born expressing eumelanin (black pigment); but as they mature the pigment changes to phaeomelanin (red/yellow pigment), resulting in a red or yellow cat. 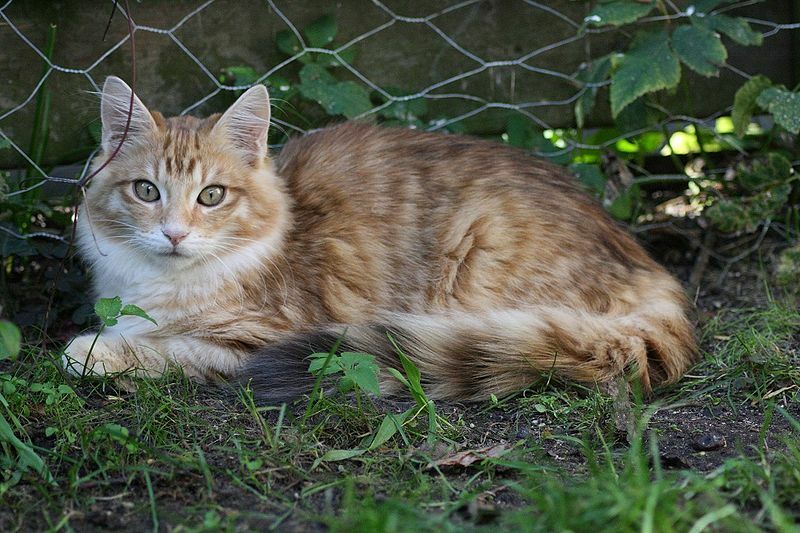 These cats can look very similar to orange/ginger cats, but the mechanism is different and they often retain some black pigment at the tip of the tail and the paws. The amber mutation is recessive and does not affect skin coloration. It is still possible that other extension mutations exist, they have not yet been located. For most purposes, it can safely be assumed that all cats that are not from Amber lines are EE at extension. Agouti (A) controls whether a cat is self-colored (solid) or striped. 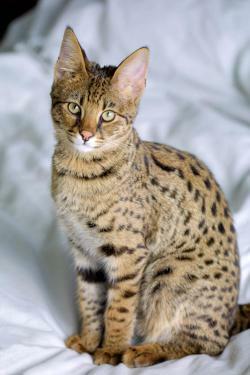 Cats that lack agouti are aa and will usually be solid colored (although sometimes "ghost" striping can be seen). Cats that carry at least one A allele will exhibit a striped, or ticked appearance, depending on which modifiers are present. It is probable that the aa cat is not a cat without stripes, but instead a cat with a base color that has been darkened to match the stripes. 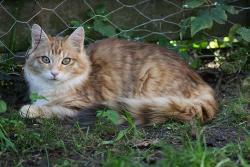 This can been seen in the orange cat, because the gene that causes orange limits the expression of aa. This results in orange aa cats that are still striped. There are several different modifiers that control how agouti expresses. The most current research on these modifiers has mapped the Ticked locus (Ti) to chromosome B1. The Ticked locus contains two alleles: TiA (ticked) and Ti+(non-ticked). Ticking does not mask the presence of the tabby genes but, rather, reorganizes the pigment from the stripes into "ticks". This reorganization starts at the body and works outward. Since Ticking is a semi-dominant trait, cats with two TiA alleles are affected more than cats with only one ticked allele. 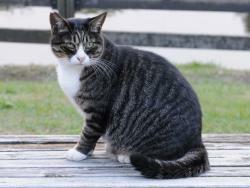 Generally, cats that are heterozygous for ticking will have residual stripes along the legs. 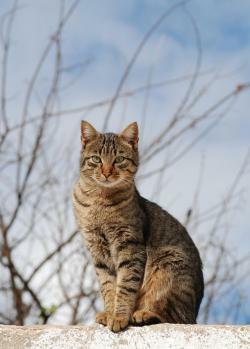 If a cat does not carry a ticked allele, then the more common tabby colors are allowed to express. Because regular tabby does not express in the presence of ticking, all of the remaining tabby variants are Ti+Ti+ at the Ticked locus. 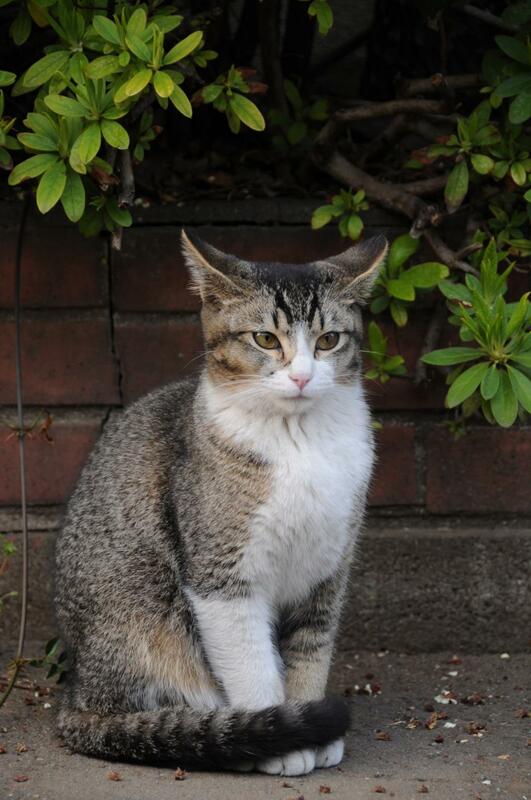 The Tabby (Ta) locus (sometimes seen as Mc, but I have chosen to go with the notation suggested by the researchers) has been mapped to chromosome A1. It contains the alleles TaM and tab. The TaM allele is the traditional mackerel tabby pattern with narrow stripes. 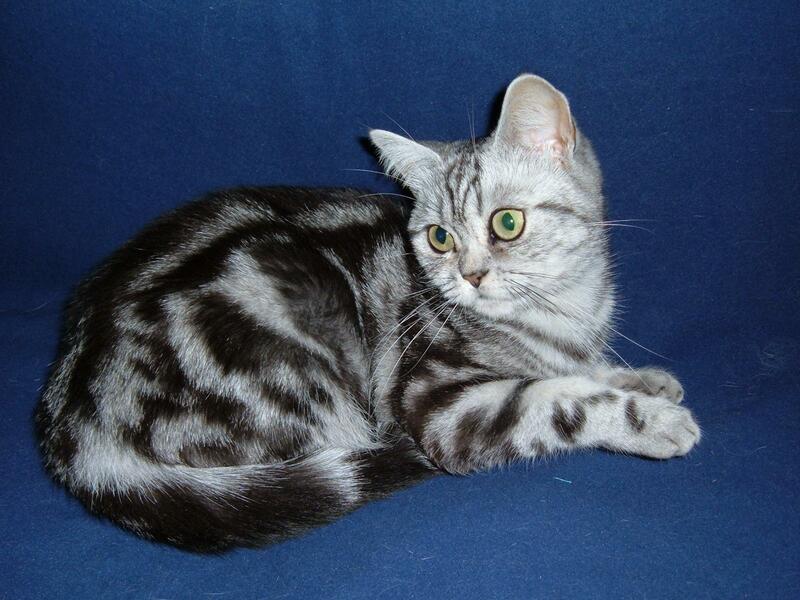 The tab allele is the blotched tabby pattern. Blotched tabby is recessive to mackerel tabby; and instead of narrow stripes, the cat will have wide, sweeping ribbons of darker color. An additional tabby pattern is spotted. 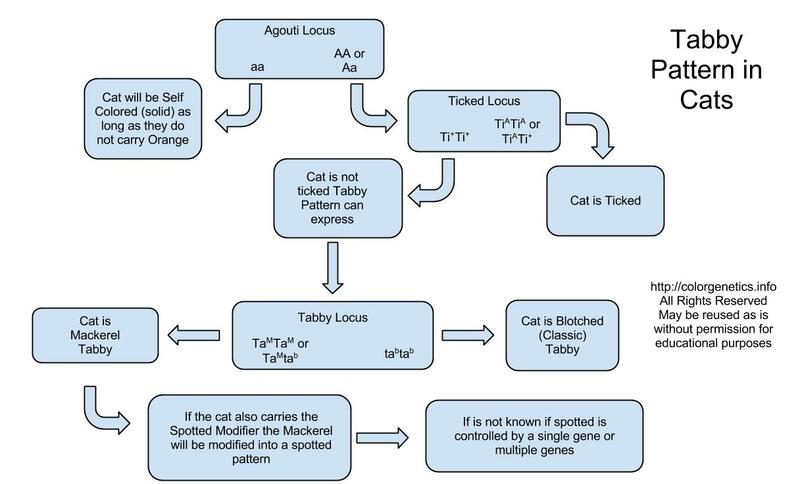 Because no additional tabby alleles have been located at the Ta locus, it is probable that the spotted pattern is caused by yet another modifier, one that affects the Mackerel pattern by breaking it into spots. The spots can be completely colored, or hollow in the middle. When they are hollow they are known as "halos". 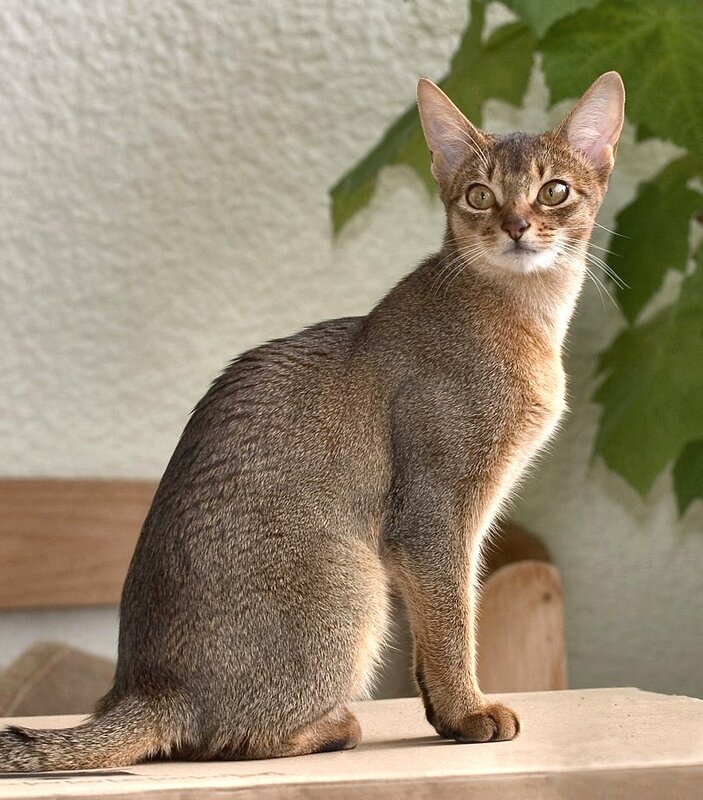 Is "agouti" in cats inherited separately from from the ticking and tabby coloration? You seem to be referring to the various tabby and ticking patterns as modifiers of the agouti gene. If so could a cat without the dominant agouti allele carry a tabby allele or a ticking allele? Yes, ticking and tabby are inherited separately from Agouti. Wild-type agouti (A) must be present for them to express. so if the tabby genes are inherited separately from the actual agouti gene that makes them work, would the tabby genes (without agouti) cause the "Ghost Striping" in black cats? 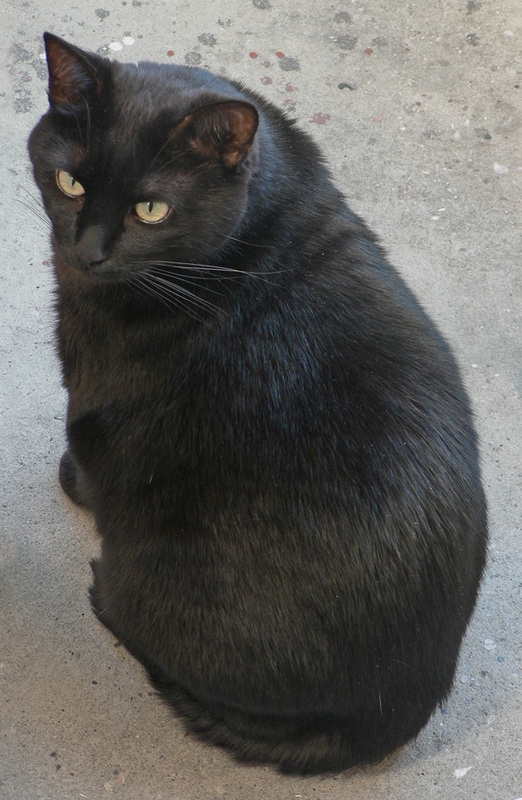 Is the ghost striping just a natural thing in black cats, and unrelated to genetics? Ghost pattern is common in solid color, or non-agouti, (aa) cats. It is most pronounced in red and cream cats, where it can take some level of expertise to even tell an agouti (A_) cat from a non-agouti cat. In dilutes (blue and lilac, ghost pattern is often visible, as well as in smokes, and sometimes in even in solid blacks. I'm looking at the distribution of the sexes of cats on a popular adoption web site, and I'm seeing roughly a 3:1 ratio of males to females in orange cats, but a very consistent 1:1 ratio of males to females in black cats. If black and orange are co-dominant on the X-chromosome, shouldn't the ratio be the same for orange cats as for black cats? Is this a real difference or is it an artifact of the way the color is classified/counted? I've tried using different probabilities of the "O" allele in a Punnett square calculation, and I'm not seeing how I can get 1:1 on the black cats while getting 3:1 on the oranges at the same time. Did you count tortoiseshell in your count? It takes two copies of orange to make a female cat orange but only one for a male. A single copy of orange makes a female tortoiseshell. Thank you for your reply. I did count tortoiseshells, and their distribution, like the calicos, is true to prediction, almost all females. But my question is about the orange only vs. black only phenotypes. If I'm understanding your comment correctly, it's harder to get females because the probabilities would be: P(O)P(O) < P(O)P(Y). But, if that were so, wouldn't the same be true for the black cats, i.e. : P(o)P(o) < P(o)P(Y)? This would mean there should be the same lopsided majority of males in orange cats and in female cats. I see the male majority in orange, and buff for all hair lengths, but it doesn't show up in the black cats. For black cats, it's always about the same number of males and females. Again, thank you for the response and discussion!